(LWI) – A petition to introduce a 130 km-per-hour speed limit on the German Autobahn (highway) is one of the steps the Evangelical Church in Central Germany (EKM) envisages in an ambitious campaign promoting care for the creation to combat climate change. The Lutheran World Federation (LWF) member church is also encouraging its staff to use electric cars and adopt car-sharing among pastors and other interested people. Another part of the campaign is a “climate forest” in which 1,200 oaks and 10 mountain ashes have already been planted as part of efforts to compensate CO2 emission during the duties of the church leadership. We are constantly being asked what practical action we as ordinary people can take against climate change. […] A speed limit would be a small but important step. It is just as important to get into discussion about this in society. The church plans to submit its Tempolimit petition to the German Federal Parliament. The idea is to collect 50,000 signatures within four weeks – starting from 4 March, the beginning of Lent. If this figure is reached, the parliamentary petitions’ committee will organize a hearing on the matter. EKM Bishop Ilse Junkermann has been outspoken about the “commitment to creation,” saying it is the church’s responsibility to take action. Germany is the only country in the European Union without a speed limit on its major highways, and the EKM petition gives three arguments for one. At least 2 million tons of CO2 emissions could be avoided; smoother traffic flow would cut down on both traffic jams and the cost for Autobahn construction and maintenance; there would be less noise and particulate matter from tire abrasion; and road safety would increase. Reaffirming its November 2018 synod decision towards climate protection, the EKM has in the last few months taken other practical steps including a project that aims at improving mobility in rural congregations that are situated far apart. The electromobility and car-sharing pilot project started with four vehicles in December 2018. The basic idea is to promote the joint use of electric cars as service vehicles for staff, combining this with “citizens’ cars” for private purposes by other interested individuals. While carbon dioxide emissions cannot be entirely avoided, EKM’s goal is to compensate for CO2 emissions from the service cars used by the central church office, the presiding and regional bishops, and also during events. 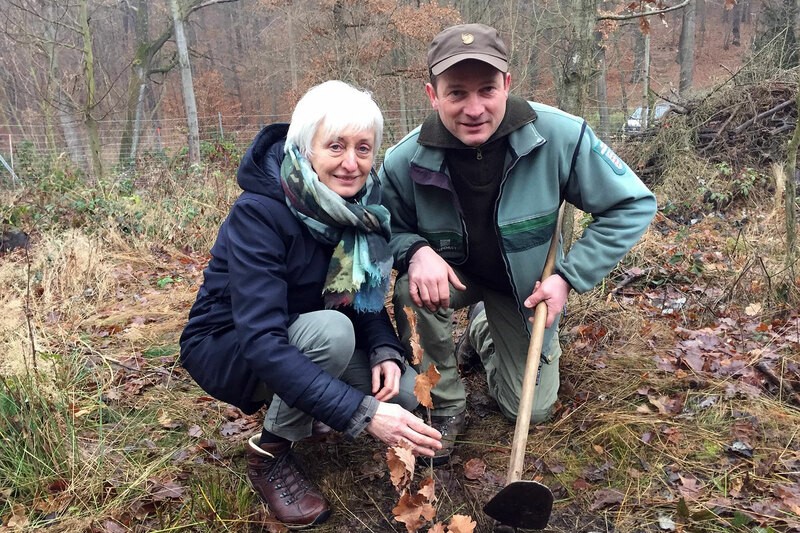 Consequently 1,200 oaks and 10 mountain ashes were planted last November in EKM’s “climate forest” near Hohenleuben, around 100 kilometers southeast of Erfurt. Now we are engaged in forestry ‘reconstruction’ and, instead of spruces, planting deciduous species suited to the location such as oaks, maples and mountain ashes, as well as the local silver firs, in order to stabilize the forest and increase biodiversity. The EKM’s decision to use its own land for reforestation instead of paying money into a climate fund to compensate CO2 emissions supports the church’s principle of initiating mitigating efforts at the local level. Thanks to the church’s pilot project, residents of the nearby village and the general public have a notice board displaying information about the intention to protect the climate and they can take walks through the forest on a firm path.